NORMAL, Ill., & ALPHARETTA, Ga.--(BUSINESS WIRE)--Atrium Hospitality today announced Migidi Tembo is the new general manager of the company’s Bloomington–Normal Marriott Hotel & Conference Center in Illinois. Tembo joins Atrium with more than 20 years of hospitality experience to oversee the TripAdvisor® Certificate of Excellence Hall of Fame hotel. The 228-room/suite Bloomington–Normal Marriott is owned and operated by Atrium Hospitality under license from Marriott international, Inc. or one of its affiliates. Alpharetta, Georgia-based Atrium is one of the nation’s largest hotel and asset management companies. Prior to his role with Atrium, Tembo was director of operations/hotel manager for the 729-room/suite Hilton Milwaukee City Center. He was responsible for assisting in managing the largest urban hotel in the state of Wisconsin. His career includes serving as director of food and beverage at the Chicago Marriott Schaumburg, where he also held the positions of director of front office and director of rooms. In addition, his extensive hospitality experience in the greater Chicago area comprises time as director of operations at the Hard Rock Hotel Chicago and as director of banquets at The Westin Chicago Northwest. Tembo kicked off his career with Starwood Hotels and Resorts, where he spent 13 years in various positions, with an emphasis on banquet and events management. He attended Cornell University with a concentration on hotel administration. Tembo holds a Bachelor of Science in hotel/restaurant–hospitality management from Johnson & Wales University in Rhode Island. Atrium Hospitality President Daniel Abernethy recognized that Tembo’s personal philosophy of striving to perform each day better than yesterday aligns with one of Atrium’s core values: perseverance. “Migidi is an achiever and sets the bar high for associate development, hotel performance and community involvement as his career track record indicates. His high standards and priority focus on the overall well-being of associates and guests make him an ideal general manager for overseeing our award-winning Marriott hotel in Normal. Migidi sets a stellar example for our talent recruitment efforts as we expand our national footprint,” Abernethy said. Tembo is a Scottish Rite Freemason centered on community service. The hotel is actively involved in several local philanthropic opportunities spanning city beautification to children’s education and also is working with the Bloomington–Normal Hotel and Lodging Association, the Bloomington–Normal Area Convention and Visitors Bureau, the McLean County Chamber of Commerce, and the Bloomington–Normal Economic Development Council. Tembo plans to pursue personal collaboration with these organizations in his hotel leadership role. Situated in Uptown Normal, the 228-room/suite Bloomington–Normal Marriott Hotel & Conference Center provides easy access to Children’s Discovery Museum, Normal Theater, Shoppes at College Hills, and Illinois State University. The AAA Four Diamond hotel is a recipient of the TripAdvisor Certificate of Excellence Hall of Fame status for consistently earning outstanding traveler reviews for five consecutive years. The stylish hotel’s spacious accommodations boast pillow top beds, custom duvets, flat-panel TVs, high-speed Wi-Fi and ergonomic workstations. Guests can also enjoy a well-equipped fitness center, a saltwater indoor pool, and a whirlpool. The on-site restaurant, Jesse’s Grille, offers delicious, eclectic dining options for breakfast, lunch and dinner with an emphasis on locally sourced ingredients. For a quick snack and Starbucks® beverages, stop by Caffeina’s Café. The nine-story property also features more than 24,000 square feet of flexible meeting space, including 15 event rooms. Electric vehicle charging stations are available complimentary. Located at 201 Broadway Avenue in Normal, the Bloomington–Normal Marriott can be reached at (309) 862-9000. Visit www.marriottnormal.com for more information or connect with the hotel at www.facebook.com/bnmarriott. 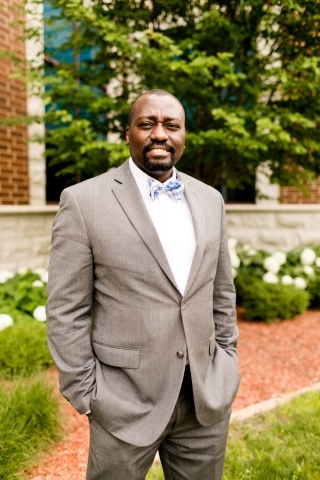 Atrium Hospitality hires Migidi Tembo as general manager of the 228-room/suite Bloomington-Normal Marriott Hotel & Conference Center in Illinois.